Avoid making "muddy color mixtures"
"What is the color I want to mix closest to?" if you had to call it either Red, Orange, Yellow, Green, Blue or Purple?" "How warm or cool is it?" "How light or dark is it?" How bright or dull is it?" The first question determines the HUE of the color. The second question determines the TONE of the color. The third question determines the CHROMA of the color. All colors have these three aspects. The HUE, TONE, and CHROMA must be recognized to be able to mix any color accurately. HUE refers to the tendency of a color to lean toward the adjacent color on the wheel. I like to use an 18 Hue Color Wheel consisting of the six spectrum colors (red, orange, yellow, green, blue, purple) plus a warm and cool version of each of these six, for a total of 18 hues. 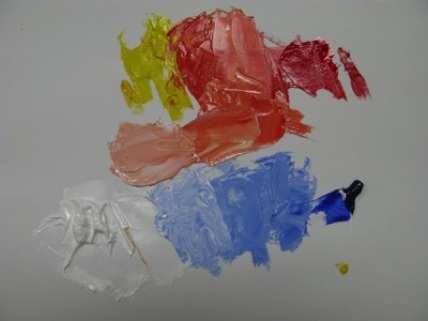 The palette I frequently use is Cadmium Red Light or Winsor Red, Cadmium Yellow Light or Winsor Yellow, French Ultramarine Blue. I also add Viridian and Permanent Alizarin to make an equal intensity color wheel. Without these two additional tubes it is difficult to achieve bright chroma in the greens and purples. Now, here is the master tip to avoid muddy mixtures while you are painting. If the chroma of the color you are mixing needs to be duller, if at all possible hold the tone of the two complementary hues that you will be mixing together. So for instance, if you are mixing flesh, and have determined the person's flesh you are mixing is an orange hue in a 4 tone on a scale from 1-10 (1 being light and 10 being dark.) Then mix the complementary blue in a 4 tone before introducing the blue into the orange. That way you can leave the two mixtures "under mixed" which results in wonderfully exciting brushwork that gives the flesh luminosity. If the flesh is a four tone, and both the blue and the orange are four tones, then you have not missed the opportunity to create change which in turn creates alive looking flesh instead flesh resembling silly putty. Make sure your color wheel is accurate. Make your own from the above limited palette. You can always test every hue on the wheel by cross-mixing complementary hues directly across from each other. They should cancel each other out and create gray that has no color cast to it whatsoever. Test out all the hues on your color wheel to see if you really have complementary hues. A reliable color wheel is essential if you are going to be able to apply this color mixing formula and get the desired results.